Art Deco is the style of glamour and luxury, but also of economy and mass production; it’s a movement that glorifies modernity while borrowing extensively and broadly from antiquity. Both eclectic and instantly recognizable, Art Deco is an indulgent, decorative pastiche full of contradictions, “syncopated by the rhythms of jazz, abstraction and exoticism in art, and a sense of joie de vivre .” The movement reached its peak during the Roaring Twenties, a feverishly optimistic period of great prosperity between the two World Wars. Like most art movements throughout history, Deco sprung out of a disillusionment with what preceded it; simplifying and abstracting Art Nouveau’s asymmetrical, undulating forms. Art Deco took its name from the famous Exposition Internationale des Arts Décoratifs et Industriels Modernes, a colossal fair held in Paris during the summer of 1925. Showcasing anything and everything as long as it eschewed tradition, this government-sponsored event was intended to cement France’s reputation as the global leader in the design and production of luxury goods. Because of this, the early days of Art Deco featured a wealth of splendidly expensive materials (sharkskin, silver, lacquer, ivory, ebony, etc.) to entice the wealthy bourgeois, who were both bored by overly-traditionalist historical styles and put off by the asceticism of modernist design . In its first exuberant decade, Art Deco flourished in Europe. Though the movement came as a widespread attempt to invent a design language suited to an interconnected modern world, it appropriated ancient Egyptian, Greek, and Mayan themes and motifs. Deco also borrowed extensively from contemporary movements like Cubism, Constructivism, Futurism, and Fauvism. Jewel tones, geometry, symmetry, and the juxtaposition of curved and straight lines were among the defining characteristics of this new and fashionable aesthetic. 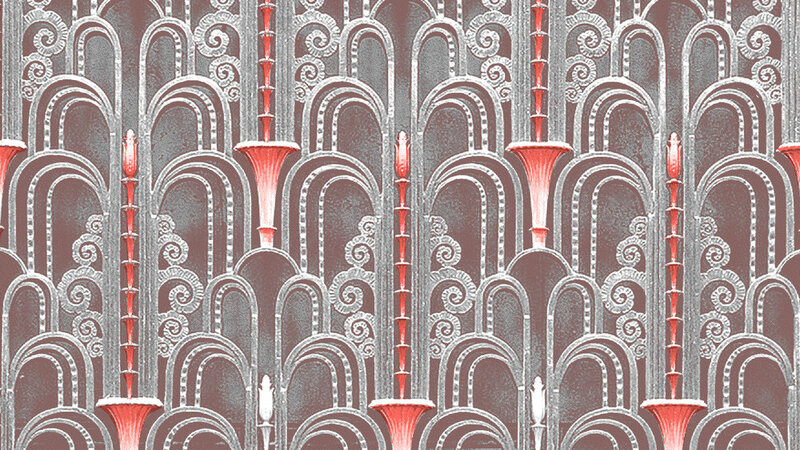 Zigzags, chevrons, fans, as well as abstracted florals and highly-stylized human and animal forms, graced everything from skyscrapers to perfume bottles. The style carried through into the 1930s. As Europe moved towards World War II, the visual language of Art Deco — stripped of its luxurious veneer but retaining all the drama — was co-opted by the Nazi and Fascist parties. “Deco had no ideological loyalties ” and effortlessly expanded to include the new nationalistic propaganda demanded of it, incorporating it into its evolution. Meanwhile, in the United States, the Great Depression had a sobering, streamlining effect on Art Deco, dictating its second incarnation as a more aerodynamic, simplified style fit for mass production and consumption. Silver was replaced by chrome, ivory and ebony became plastic and Bakelite, while reinforced concrete took the place of marble in architecture. Craving a few hours of escapism, Americans flocked to the thousands of newly-constructed Art Deco-style movie theaters. Here they could experience images of faraway lands, glittering Hollywood film stars, and elaborate sets, further cementing, even in this time of great financial distress and frugality, Art Deco’s association with glamour, exoticism, and modernity. This essay was originally written for my Art Deco Lettering workshops held in Portland, OG and Gold Coast, Australia. For more information, click here. Euro Deco by Louise Fili and Steven Heller  · Overflowing with stunning images and great information about design between the wars. Deco Type by Louise Fili and Steven Heller · Another must-have that focuses exclusively on the typography of this period. Art Deco Society of New York · A great resource for New Yorkers and Deco devotees alike. In addition to a good deal of fantastic information about the period, the website contains a series of essays written by experts in the field attempting to answer the question “What is Art Deco?” I’ve referenced all of them and quoted a great line from Marilyn F. Friedman’s . The Met Essays · The Metropolitan Museum of Art offers a staggering collection of essays spanning most of art history. These informative pieces are all online and free to access. I referenced the following: Design 1900–25, French Art Deco, and Design 1925–50. I hope you enjoy reading my thoughts about lettering, art, and design. If this is your first time visiting, here are some recent posts to get you started. Use the form below to sign up to my email list and receive new articles and news directly. Learn more here.